Diabetes cases in the Western Pacific region represent 37 percent of the total worldwide cases, according to Pacific Chronic Disease Council Chairman Patrick Luces. 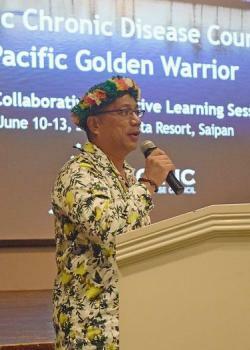 The council and the Commonwealth Healthcare Corp. are hosting a four-day collaborative-learning session for the region's health officials from Monday to Thursday in the Hibiscus Hall of the Fiesta Resort. “We have some of the worst numbers for diabetes and chronic diseases – it is everyone's responsibility to address noncommunicable diseases and the people's lifestyle,” said Luces, who is program coordinator of the Department of Public Health and Social Services on Guam. Gwendolyn Hosey, director of the National Association of Chronic Disease and a PCDC consultant, said their collaborative-learning sessions are for the U.S. affiliated Pacific Islands – the CNMI, American Samoa, Guam, the Republic of Palau, the Republic of the Marshall Islands and the Federated States of Micronesia (Chuuk, Kosrae, Pohnpei and Yap). “People come together every six months, and they showcase the work they are doing in connection with the prevention of noncommunicable diseases,” Hosey said in an interview. The data presented in the ongoing learning session pertained to foot screening for people with diabetes, self-care education, management of blood sugar and prevention of high blood pressure. Hosey said the officials meet twice a year. On the first day of the session, one of the subjects discussed was the Pacific Care Model, a community and health partnership approach to addressing noncommunicable diseases in the Pacific….